In the pre-dawn hours of August 24th, 1305, in London's Smithfield Prison, the outlaw William Wallace -- hero of all the Scots and deadly enemy of King Edward of England -- sits awaiting the dawn, when he is to be hanged and then drawn and quartered. This brutal sundering of his body is the revenge of the English. Wallace is visited by a Scottish priest who has come to hear his last confession, a priest who knows Wallace like a brother. Wallace's confession -- the tale that follows -- is all the more remarkable because it comes from real life. We follow Wallace through his many lives -- as outlaw and fugitive, hero and patriot, rebel and kingmaker. His exploits and escapades, desperate struggles and victorious campaigns are all here, as are the high ideals and fierce patriotism that drove him to abandon the people he loved to save his country. William Wallace is the first heroic figure from the Scottish Wars of Independence, a man whose fame has reached far beyond his homeland. Wallace served as a subject for the Academy Award -- winning film Braveheart. 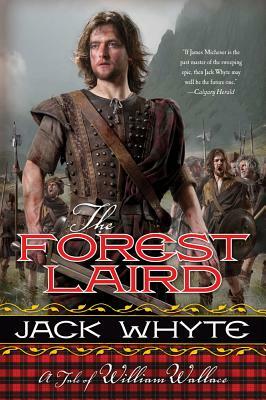 In The Forest Laird, Jack Whyte's masterful storytelling breathes life into Wallace's tale, giving readers an amazing character study of the man who helped shape Scotland's future.